Unlike some other more well-known hosts of late, I don't think I have ever had "crashers" at any party I've thrown! I have been fortunate enough to be invited to some elegant and fun events as well as to host some really good parties, if I do say so myself! More about those later! For a time, when Mr. T&C was running the rat race for the Mouse, we were obligated to attend quite a few parties--the "official" department party; the department head's party; the big boss's drop-in; the peer group dinner, and so on; we also were expected to attend our church's vestry dinner. Add in a couple of neighborhood parties as well as a couple of get-togethers we really wanted to attend, and the calendar was full. One evening, early in the month, I remember getting the children ready for Hope, aka the perfect babysitter, and Middle looking up at me with his four-year-old face, saying, "when am I going to a party?" Ouch. Of course, in his precious world, parties meant only fun and cake and games--not the vapid small talk and endless sizing up and comparisons of corporate wives. But still. So, the next day at the grocery store, I tossed in a few extras. 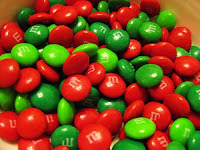 And while the children were playing that afternoon, I mixed up Chex mix and put in red and green M&Ms. 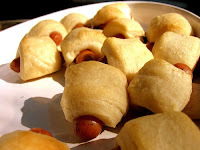 I cut out crescent rolls and made Pigs in a Blanket. I arranged carrot and celery sticks and mixed up the easiest recipe of spinach dip. I sliced cheese and set out the fancy crackers. I made some slice-and-bake cookies. When they asked what was for dinner, I was vague. While they watched "Arthur," I found a gold gel pen and some leftover invitations and wrote out our "menu" on one of the cards and placed it on the dining room table with the heading "Trim a Tree" party. When Mr. T&C walked in the door, I said, "turn on some fun Christmas music, we're having a party," and, to his great credit, he didn't miss a beat. And so, nine years ago, we began to host a most exclusive party. If you're not of the right bloodline, you simply can't get an invitation! Our children still look forward to this night. Even though they are eating more sophisticated foods these days, they still insist on Pigs in a Blanket and Chex Mix with M&Ms. Last year, we invited two dear friends to join the fun, and they'll be with us this Sunday night, too. Don't even think of crashing; our security is top-rate! 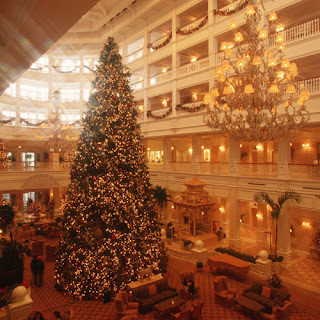 I'd love to hear about your favorite Christmas party!